Here is one very interesting building design in which same design is repeated again and again. So if we zoom into this building we will find same building hidden there and again zooming in will give us the same results. So at the end building never ends no matter how many times we zoom into the building. 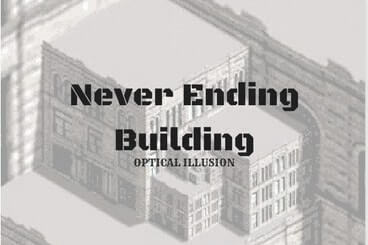 Below Optical Illusion show this design of Never Ending Building. 1. Great and Mighty Optical Illusions: Checkout these Great and Mighty Optical Illusions which will blow your mind. 2. Incredible T-Rex hollow face illusion: This is one of the best optical illusion I have seen. In this optical Illusion a stationary T-Rex seems to be moving. Do check it out yourself. 3. Can You Guess the Place By a Picture of It? : After looking at the Optical Illusions, it is now a quiz time. Lets see if you can name the place by looking at the picture of it? 4. Awesome Missing Number Math Circle Puzzles: After all the visual and observational tests of your eye, it is time now to give a Maths test in which your challenge is to find the missing number.